For Alabama head football coach Nick Saban, his words of consistency, effort, having a strong mentality and good preparation skills have taken an effect on some of the younger players. D.J. Dale – a freshman defensive lineman — is one of those guys that is not just buying in, but he’s also playing with a sense of confidence. The four-star from Clay-Chalkville High School (Pinson, Ala.) was one of six big men signed in the Crimson Tide’s 2019 recruiting class. Listed at 6-foot-3 and 314 pounds, Dale brings exceptional size, quick feet and strong hands to the nose guard position. Along with being listed at No. 179 on the ESPN 300 and earning Class 6A first team All-State honors as a junior in 2018, Dale strikes as a player in Saban’s mind who has the commitment, drive and passion to be either excellent or elite on the field for Alabama football. Prior to the second scrimmage on Saturday, sources confirmed with Touchdown Alabama Magazine on how Dale has been the “most consistent” lineman out of the young guys. 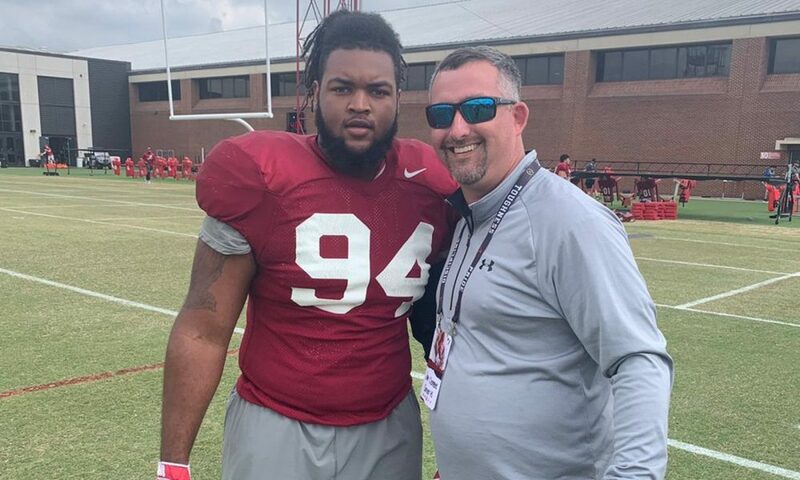 He has been productive all spring and during the warmup session at Bryant-Denny Stadium, he was seen taking reps with Raekwon Davis and LaBryan Ray. Dale spent half of the second live exhibition with the first-team unit and per Saban, he has a lot of “maturity” despite his age. When it comes to some of the other guys, Saban credits their mistakes to the competition forcing them to “dumb down” on the field. While he is showing out over Antonio Alfano and Justin Ebiogbe, incoming players Byron Young and Ishmael Sophser will arrive in the summer. For now, Dale may be one of a few freshmen will make a contribution in the fall.